During my weekly walks in Central Park, I always come across some of the park's bridges and arches. There was even one time when I went around the park to look for their exact location, as some are kind of hidden in plain sight. Calvert Vaux and Frederick Law Olmsted won a design competition to improve and expand Central Park with a plan they titled the "Greensward Plan". The Greensward Plan called for some 36 bridges, all designed by Vaux, ranging from rugged spans of Manhattan schist or granite, to lacy Neo-Gothic cast iron; no two are alike. When President Washington resided in the city, the nation's capital in 1789 and 1790, he was accustomed to a daily ride until, for reasons of health, he took to a carriage. This meant that, to the drive and footpath, was added a third right-of-way, the bridle path. The two planners had, from the start, mandated a separation of traffic, easy enough to do with two kinds of right-of-way; now a third was to make for more crossings. In the days before the traffic light a bridge was the only answer. The park fell into disrepair when cars became common-place and the Central Park Commission was dissolved. In 1934, Robert Moses was tasked with the cleaning up of the park. Playgrounds and ball fields were created, and in the process, some of the arches had to be destroyed. Currently, there are thirty bridges and arches in Central Park, five of which are cast-iron bridges. This number does not include the rustic bridges which can be found in the Ramble and the North Woods section of the park. Last week, a friend wanted to check out the arches so we made a plan to go to and document as many as we can. I will link their specific pages from the book, as it contains detailed description of the bridges. 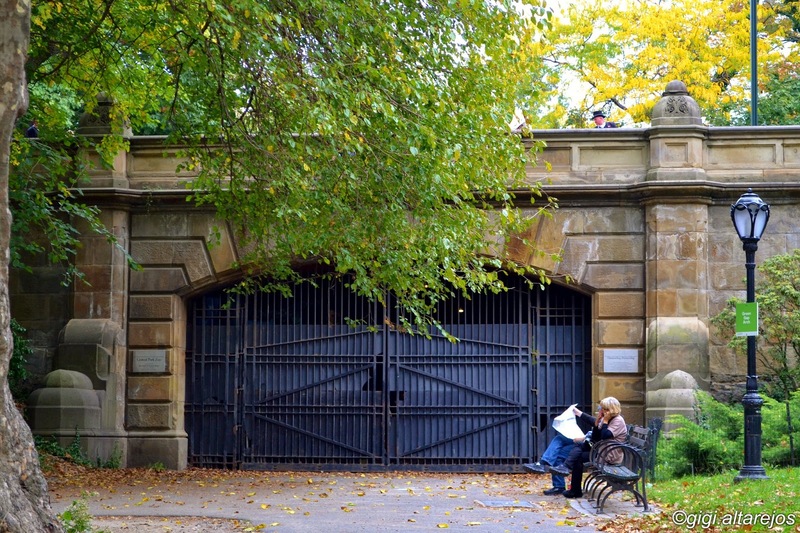 We agreed to meet at Denesmouth Arch, which is near the Central Park zoo, and supports the 65th Street transverse. Denesmouth is constructed of pale-olive New Brunswick sandstone, blackened by years of exposure. The arch is visually strengthened by the voussoirs, alternately long and short, fanning outward, spanning 37 feet 3 inches, with its top 14 feet above the path. The balustrade of Denesmouth Arch has four large posts, which originally carried ornate bronze lampposts, elegant and monumental in character. Three of these lampposts were stolen several years ago, and the fourth is now in storage, as a model if future replacements are installed on the bridge. After Denesmouth, we passed by the Delacorte Clock and the Central Park zoo and made our way to the next arch, Inscope Arch. Little did we know that the expansion of the zoo destroyed one of the park's cast-iron bridges, the Outset Arch. Outset was a cast-iron bridge spanning the bridle path at roughly the southwest corner of the present Zoo. Originally, the bridle path came east around the north end of the Pond, then went under Green Gap Arch to turn south and exit at 60th Street. Due to the ever-growing popularity of the park, there resulted a second wave of bridge construction, after the Civil War, chiefly in the south end. Outset was started in 1873 and finished in 1875. Like the still-standing Pine Bank Arch, and the vanished Spur Rock Arch, Outset had an elaborate arch, railings and posts as we know from fourteen surviving drawings. The cast-iron tracery and other ornament, very much part of the Civil War era, distinguished it. In the 1870's, the park paths were used by pedestrians, horseback riders and carriages, and there was always a traffic problem. 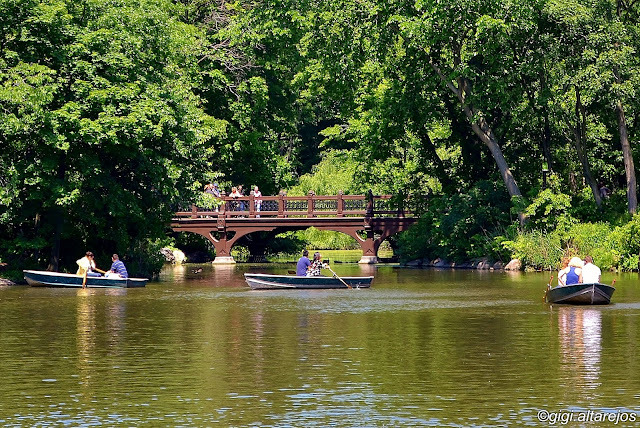 Frederick Law Olmsted recommended three new bridges: the original Gapstow Bridge, Outset Arch over the bridle path, and Inscope Arch, the only original one of the three that still remains. Good thing Inscope Arch wasn't destroyed, I love this little hidden arch! From the entrance of the zoo looking south, we veered right and went down a few steps to access it, as the arch is not easily seen from the path. Inscope is well worth a special visit. Beautiful ornamental pink granite surrounds the gray granite that borders the half-oval opening of the archway, 13 feet 7 inches across at the base and 12 feet high in the middle. The archway is Tuscan, that is to say, the top of the voussoirs makes an ogival pattern and the bottom a round one. Encompassing the whole above is a cornice in a segmental arc. Inscope's underpass is 34 feet in length. It has a 100-foot-long railing on top. The other side of Inscope Arch opens up to The Pond, which gives visitors a great view of midtown Manhattan. When we were there, the trees were already full of leaves and you could hardly see the buildings. In winter, it's another story. Inscope Arch is near Green Gap Arch, which was a walkway under the drive that comes from the Zoo and goes west. Originally it was part of the bridle path under the arch, permitting entry and exit at the Scholar's Gate, Fifth Avenue and 60th Street. Currently, it is closed-off and used as a storage area. With an underpass 81 feet long, it has a shallow segmental span, 25 feet wide and 13 feet 3 inches high. The facing of Alberta sandstone, from the quarry in New Brunswick, is set in ashlar that continues the outlines of the voussoirs. Posts of the parapet continue downward as supporting piers of the abutments which have, in part, been concealed by the soil of the planted slopes. For the stonework of this archway, Jacob Wrey Mould, assisting Calvert Vaux, made drawings of the details that were then sent to the contracting stoneyards to be cut and shaped to specification. These drawings are in the Municipal Archives. Most of the times there are park vehicles parked by the Green Gap Arch, as it was when we were there. The above photo is one I took last autumn. That bench is a favorite of the puppet Big Bird, I have seen him there many, many times. Near Green Gap Arch is Cat Rock, which has awesome views of midtown Manhattan. Looking at the lower left corner, I could see one of the arches, Driprock Arch, but we had other bridges and arches to check out first. Coming down from Cat Rock, we were at the northeastern end of The Pond where Gapstow Bridge lies. Originally, Gapstow was a wooden bridge supported by the unique feature of a large segmental arch of wood on the north and south sides, both arches springing from ledges on the stone abutments. Along the wood walkway of the bridge the railings were of cast iron. Gapstow was a unique design using wood and cast-iron trimming, drawn for this commanding site over the Pond, in the picturesque landscape of the Park. It was to last a little more than a score of years. Conjecture has it that wear and tear were simply too much.The current stone replacement, designed by Howard & Caudwell in 1896, is built of unadorned Manhattan schist. It spans 44 feet of water at its base with a 12-foot high arch, and it has imposing 76-foot long sidewalls extending the full length of the bridge. The Gapstow Bridge is the first bridge or arch you see in the park when you enter it from the southeast side. I've written about the Gapstow in different seasons on a previous blog. Here's the other side of the bridge looking north. Then we proceeded to that arch we saw from Cat Rock, Driprock Arch. Here's my friend Angel in front of the arch, check out his site! An elliptical archway framed in sandstone, Driprock spans 24 feet, reaching a height of 11 feet. The underpass runs for 65 feet while the balustrade extends 79 feet 8 inches. Driprock suffered considerable deterioration through the years due to weathering. It is one of the few archways where red brick is used for revetment, combined with sandstone trim at the arch and the balustrade. Octagonal insets with rosettes add touches of color and texture. Above the arch and red-brick spandrels rests the cornice and the balustrade with its open stonework of Gothic detail in New Brunswick sandstone. A number of the sandstone balustrade pieces have been replaced by cast stone, an expedient remedy considering the plague of the balustrades along the park drives: careening cars. That red brick looks so pretty! Next on the list was the Playmates Arch, which derived its name from its proximity to a number of major park attractions devoted to children: the Dairy, which once served fresh milk and other refreshments, the Kinderberg, a huge rustic shelter replaced in the 1930s by the Chess and Checkers House, and the nearby Carousel. Playmates Arch is one of the most ornate masonry structures in Central Park with its characteristic Philadelphia pressed brick and Milwaukee yellow brick-belt coursing and granite trim. In his description of Central Park in 1864, Frederick B. Perkins called Playmates the "tricolored archway." The span is 17 feet 8 inches wide, and 9 feet 11 inches high. The underpass is 66 feet long. Near the southern end of the park and Seventh Avenue lies Dipway Arch. Dipway represents another Calvert Vaux archway designed with a variety of stone textures. Ten original drawings of Dipway remain. The elevation shows granite masonry (the granite is from Rackcliff Island, near Seal Harbor, Maine) set in even courses of ashlar alternating with bush-hammered blocks. The bluish granite is worked into a dramatically shaped coping that caps the tops of the archway and curves along the abutments. The segmental arch is small, measuring 15 feet 6 inches wide and 11 feet 7 inches high. Like the Driprock Arch, the Dipway Arch also has red bricks for its underpass. The red brick that lines the underpass is set in stripes of bricks on an angle. The walls are paneled in blind arcades of seven arches, each with a granite keystone. The center bay of the west arcade has been filled with cement. Benches built along the walls invited visitors to rest in the shade. It was another time when archway underpasses provided for comfortable rest and shelter from the hot summer sun or rain. The book Bridges of Central Park mentions that a short distance from Dipway Arch was Spur Rock Arch, which was demolished because it got in the way of the expansion of the Heckscher Playground. Instead of being incorporated into the playground, Spur Rock, probably looking old-fashioned, rundown and unimportant in 1934, was destroyed. It was, in fact, irreplaceable. Six drawings of the arch survive at the Municipal Archives. Too bad! That sure looks like one beautiful bridge! After Dipway Arch, we walked northwest towards Pine Bank Arch, one of the park's five remaining cast-iron bridges. Pine Bank Arch is located just east of the West Drive in line with 62nd Street, it carries a 16-foot-wide pedestrian walkway 11 feet above the bridle path. It was restored in 1984 with the Parks Department's plan for rehabilitation of park structures. Long called Pine Bank Arch, this pedestrian crossover is more accurately a bridge. The 80-foot-long walkway is situated between two long, sloping natural rock outcroppings and has two shaped concrete on the remaining structure. The deck of concrete was replaced with the wood we see today. Isn't that lovely? This is the bridge viewed from below where it nestles amidst the pine trees, rocks, and other verdant plants in the park. Just a few 200 feet away from Pine Bank Arch is Greyshot Arch. Most of Greyshot Arch was constructed in 1860. The arch was in use by 1862, and the 100-foot-long sandstone balustrade was set in place a year later. Part of the balustrade is carved with stylized fleur-de-lis. Buttresses flank the archway, rising from curved supports to posts that have round tops in imitation of a modified boss with a diamond point. Modified bosses hold down the supports. Greyshot Arch is faced with ornamental Westchester County variegated gneiss, a whitish-gray stone with veins of dark orange. It provides a contrast to the muted, earthy New Brunswick sandstone molding of the elliptical arch and balustrading above. The vaulted archway is lined with Philadelphia red brick and has a 30-foot, 6-inch-wide and 10-foot, 1-inch-high opening. Greyshot has a passage 80 feet long. That 80 feet of red brick looks gorgeous, don't you think so? Just a few meters north is Dalehead Arch which carries the West Drive over the bridle path with a span 80 feet long. It is 11 feet high and 24 feet deep. Begun in 1860, like so many of the bridges and archways in this area of the Park first prepared for public use, Dalehead was completed by the year 1862. The elevations are built of sandstone blocks of random size. The smooth, elliptical arch is hemmed with a brownstone ring molding. Buttresses at the sides of the arch swing out as revetments against the soil embankments that unite the archway with the landscape. Carving enriches the spandrels of the revetments and their terminals. Above, the 77-foot balustrades along the Drive are of sandstone, ornamentally carved with quatrefoil cutouts. Inside the arch, the brownstone ring molding complements the bricks and enhances the design of the arch. We are now walking along the west side bridle path to get to the next two arches. Riftstone Arch is an unobtrusive archway near Central Park West and 72nd Street, just inside the park entrance and directly across the street from the famous Dakota apartments. By the use of little or no mortar and of megalithic blocks of Manhattan schist, the rustic note is conveyed. 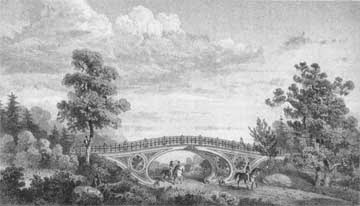 Vaux's aim was to have some "natural" bridges in his picturesque landscape. Those of brick and mortar would, in a number of instances, have appeared "unnatural." The segmental arch is low and wide, measuring 30 feet across and 11 feet 10 inches in height. Abutments are concealed in the surrounding landscape by large boulders and surrounding trees and shrubs. Here's the view looking back at the arch after we passed it, it's nearly hidden with all the plants and trees surrounding it. We walked further north until we reached the park's only double arch, the Eaglevale Arch. Eaglevale Bridge carries an access road to the West Drive from Central Park West over the bridle path and what was a narrow arm of the Lake going from Balcony Bridge to the Ladies' Pond directly to the south. The Ladies' Pond, considered a nuisance, was filled in around 1936 and its site given over for the playground that is there today. The one-time presence of the Ladies' Pond explains the need for a second arch in addition to the one over the bridle path. That there was once a branch of the Lake here is the reason why the nearby lawn and the bridle path are under water after a storm.The handsome structure has revetment in blocks of gneiss in rockface random ashlar although the stones are not as big nor as "rustic" as those of Riftstone Arch four hundred yards to the south. Between the two spans, on either side, are balconies resting on buttresses. Eaglevale Bridge is 150 feet long and 36 feet wide. The west arch is 13 feet 6 inches high over the bridle path and 31 feet wide. The east arch is 18 feet high over the filled-in arm of the lake and 33 feet 6 inches wide. Here's a look inside the west arch, its underpass seems to be also made of bricks. We made a slight turn from the Eaglevale Arch to go further inside the park and saw this rustic bridge. There was a small plaque on one side that says Triplets Bridge. We then took a sloping path up towards the West Drive and the Balcony Bridge. The bridge's east side has two bays which are corbeled out, forming small balconies with stone benches. 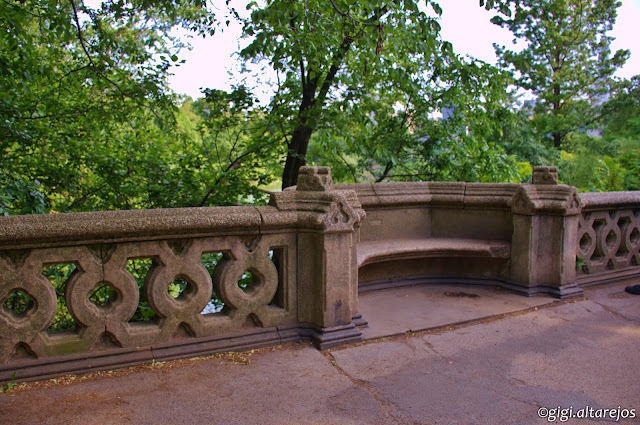 These benches are always full of visitors resting, or taking in the sights of The Lake as the bridge provides the most scenic of all views over the Lake toward the Central Park South and Fifth Avenue skylines. Supporting the West Drive, this structure spans a narrow strait between the Lake and what was the Ladies Pond, the western arm of the Lake close to Central Park West. Reserved exclusively for ladies iceskating in the 1870s, it was filled in during the 1930s.The bridge's arch is constructed of Manhattan schist excavated in the park, and mountain greywacke, a light-bluish sandstone set in random ashlar. The elevation shows an elliptical arch outline with a sandstone molding and coping. This arch measures 27 feet across and 11 feet 6 inches high, a little more than enough to allow passage underneath while standing up in a rowboat. The underpass is 65 feet long. There are no balconies on the bridge's west side, a rare example of a bridge with different sides, the only other in the park being Trefoil Arch. Across the Balcony Bridge lies The Ramble, and from there you'll have a great view of the arch of the bridge straddling The Lake. Parts of the sandstone railing with open quatrefoil pattern have been replaced by indifferent cast stone rather than cut stone. Viewed from the Ramble, the light-colored stone Balcony Bridge stands out from the lakeshore and is often dramatically reflected in the surface of the water. Its elliptical arch is further emphasized by the jutting prominence of the balcony supports. The above description further states that Clarence Cook in Description of the New York Central Park (1869) believed this to be one of the handsomest bridges. Do you agree? Just a few feet away lies Bank Rock Bridge, it was originally built of white oak, hence its early name, Oak Bridge. The Bridges of Central Park was published in 1990, long before the bridge was recreated in 2009 by the Central Park Conservancy using historic photographs and original drawings. I will attach below a description about the bridge from the park website. Designed by Calvert Vaux, Oak Bridge is one of the larger and more elegant of the Park's wooden bridges, it featured panels of decorative cast iron set in the railings. Created as one of the major entrance to the Ramble, it's become one of the most popular Park destinations for bird watchers and offers one of the best views of the Park and the famous New York City skyline.The bridge suffered repeated rounds of deterioration and restoration through the years. It was replaced in 1935 and restored over the ensuing years from an entirely utilitarian perspective. The Conservancy completed its re-creation and restoration using historic photographs, archival records, and Vaux's original drawings. Almost entirely built anew, the bridge project marked the Conservancy's most complex reconstruction of an original Park structure. The new bridge is built of steel clad with ornamental castings, and its decking and railings made of wood. The stone abutments and piers that act as supports for the bridge are the only remaining elements of the historic bridge. There were too many people on the bridge to take a decent shot when we were there so here's a previous shot of the bridge taken from Hernshead across The Lake. But I did take a shot that day of the gorgeous view of the city from Bank Rock Bridge. Did I say gorgeous? Bank Rock Bridge connects the West Drive to The Ramble, and nestled inside among the trees and winding paths is the Ramble Arch. Among the uneven hillocks and trees shading the sun is this narrow structure placed in a cleft between two high rock outcrops. Its arched opening measures only 5 feet across, rising to a height of 13 feet 6 inches. Ramble Arch has a passage 9 feet long and 32-foot sidewalls along the top. Except for the base course, the voussoirs and blocks are boulders found in the park, flattened at their sides and "Laid to appear like dry wall, but interior in cement." The rockface ashlar, which gives it an especially picturesque quality, varies in low relief to being almost flat. In contrast, the parapet walls on top are in pronounced rockface. Large boulders specially moved here heighten the dramatic setting. It is impossible to pass underneath Ramble Arch without feeling that you are in one of those very special, faraway places in Central Park. The passage on top of the arch is narrow but it looks like it leads to an enchanting space. Isn't that exciting? The Ramble Arch is the fifteenth bridge/arch we visited, which is half of the total arches and bridges in the park. I will write about the other fifteen bridges on my next blog. Hope you all enjoyed walking with Angel and me as we visited the beautiful bridges and arches of Central Park. I will end this piece with a photo I took of The Pond on my way to the first arch I featured above. That was really a gorgeous day! The next fifteen bridges and arches are on Part 2 of this blog. A day spent walking with a friend in the park that I love, it's just my kind of day. Thank you all for walking with us!